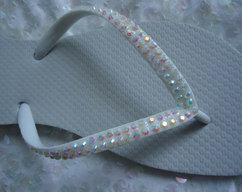 An all white or blush flip flop base is covered with vibrant crystals all the way to the end. This is a smaller crystal, super blingy, THREE crystals across, over 40 crystals in each row! No color cast, just tons shine, shine, shine! This is an Old Navy base and they tend to run on the small side this season,order up a size, no half sizes. Delivered in a fabulous organza drawstring gift bag...all packaging comes free. 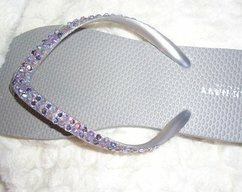 Brides...order three pair any style or size and I will send you a FREE bride tote! !